Home / Armageddon / Movies / 10 Things You Didn't Know About "Gattaca"
On October 24, 1997, the movie Gattaca was released in theaters. Set in a dystopian world where everyone is judged by their genetic profile, one man buys someone else's genetic identity to become an astronaut. Starring Ethan Hawke, Uma Thurman, and Jude Law, the movie has become a cult hit and a milestone in science-fiction film. You may have seen the movie, but here are a few things you probably didn't know. 2. Gattaca Comes From DNA - The name Gattaca is based on ATCG, the first letters of DNA's four nitrogen bases (Adenine, Cytosine, Guanine, and Thymine). The four letters are used in the notation of genetic sequencing. 3. Gattaca's Futuristic Building Was From The Past - Many of the exterior and interior shots of the Gattaca Corporation were filmed at the Marin County Civic Center, designed by Frank Lloyd Wright. Though it was built in 1960, it had a futuristic look that Niccol wanted for the film. The Civic Center was also used for George Lucas' film, THX 1138 . 4. Gattaca's Futuristic Cars Were From The Past - Niccol wanted to avoid the typical sci-fi trappings of floating cars and spacesuits. Niccol also didn't have the budget to create futuristic cars for the movie, so he used existing cars such as the Citroen DS Cabriolet and the Studebaker Avanti, because of their futuristic design. 5. Gattaca Got Too Close For Comfort - The original ending for Gattaca featured images of Albert Einstein, Abraham Lincoln, and Jackie Joyner, along with text stating that if genetic screening had existed in their lifetime, they would never have been born. All three suffered from genetic flaws; Einstein had dyslexia, Lincoln had Marfan’s Syndrome, and Joyner had asthma. It also ended with the text that "you" (the viewer) wouldn't have existed, either. The ending was cut, because test audiences were uncomfortable with the suggestion that they were genetically inferior. 6. Gattaca Started An Argument - The movie has inspired a term called the Gattaca argument, which is based on the idea that genetic engineering will lead to a divide between the rich and the poor. The fear is that as science makes it possible to screen humans for diseases in vitro, the desire to screen out other "undesirable" traits will be too great a temptation. Gattaca portrays an extreme vision of a world where people are defined entirely by their genetics, not on their abilities. 7. People Wanted It To Be Real - The movie was promoted with a fake ad in the Washington Post for a company offering to genetically alter embryos with the tagline "Children made to order." The ad had a list of genetic traits that could supposedly be added to the child, along with a phone number. Thousands of people called the number, wanting to have their unborn children altered. 8. The Eighth Day - The original title for the movie was The Eighth Day, a reference to the Bibilical days of creation. By the time the film was completed, another movie had been released called The Eighth Day, so Niccol had to change the title to Gattaca. 9. 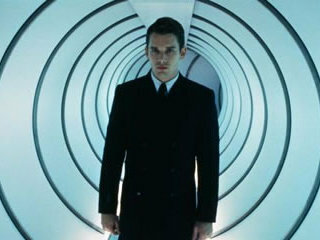 Gattaca Is The Most Plausible - In 2011, NASA declared Gattaca the most plausible science-fiction movie ever made. The idea of a world defined by genetic traits is one that many scientists fear will come to pass if genetic screening becomes more common. By contrast, Armageddon is considered by NASA the most implausible scifi movie ever made. 10. Gattaca Was a Bomb - Gattaca was a box-office flop when it was released, making only $12 million in theaters, not even recovering the budget of $36 million. However, it has gained a large following on home video. UPDATE: Fixed error about Niccol directing The Truman Show. Didn't know some of that. It's been a while since I've seen it. All I remember is the slow but interesting pace of the movie. Andrew Niccol fact-lovers unite! The Truman Show was written by Andrew Niccol but directed by Peter Weir. This is a good thing. As well as GATTACA, Andrew Niccol directed S1M0NE and Lord Of War, and most recently In Time. Hey, I'm a big fan of Gattaca and enjoyed the article, but Peter Weir, not Andrew Niccol, directed The Truman Show (stated in point 1). Sorry about that, you're right. Fixed the error. My heart skips a beat whenever i hear Vincent saying "I never saved anything for the swim back". What a movie! Pretty sure some of the inspiration came from the holocaust and the Nazi Eugenics policies put in place when Hitler came to power in 1933. I was disappointed to find this hasn't been based on a book of any kind. I was really looking forward to reading this story with the depth a book can deliver.